Voice launched its new high class smartphone with smart sensor technology which is called voice Xtreme X3, also called it next generation smartphone or Tomorrow is Now. Xtreme X3 has all latest spec like other smartphones available in black color if we are talking about voice Xtreme X3 body it has a slim and sleek body which is capable of supporting dual Sim cards on the go with dual stand by. 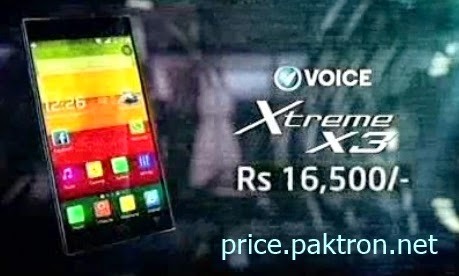 Voice Xtreme X3 comes with these specifications Android version 4.4 Kit-Kat, 8 GB built-in Storage memory (no need of external memory card because it has 8 GB internal memory which is enough for users), 1 GB RAM, 1.3 GHz Quad Core Processor, Bluetooth, USB, WLAN, GPRS, EDGE, 3G, 4.5 Inches IPS + OGS Display, Dual Sim, 3G, GPS + A-GPS, FM Radio, Audio/Video Player, 2000 mmAh Battery Power. 8 Mega-Pixel HDR Rear Camera with Auto-focus and Flash Light, Video and found 2 Mega-Pixel Front Camera for video calling.